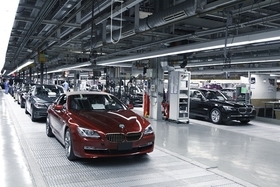 BMW's production shutdown at its Dingolfing plant (shown) will be as short as possible to keep up with demand for its 7-, 6- and 5-series models. BERLIN (Bloomberg) -- BMW AG and Mercedes-Benz will shorten Christmas breaks at their factories because of surging demand for new models. BMW's German plants in Dingolfing and Leipzig will stay open over the holidays after halting output for about three weeks in 2009. Dingolfing makes the new-generation 5 series and Leipzig produces the strong-selling X1 crossover introduced last year. Mercedes's Hamburg factory, which supplies parts to vehicles including the Mercedes E- and S-class sedans, will also remain in operation through the holidays. Luxury-vehicle demand is bouncing back from the financial crisis on a rebound in the United States and growth in China. BMW and Mercedes each target sales growth of more than 10 percent this year. Audi, the luxury unit of Volkswagen AG, plans to add shifts next month to cope with record orders. “This is the first strong signal that the boom over the last few months can continue into next year,” said Juergen Pieper, a Frankfurt-based analyst with Bankhaus Metzler. A shortened holiday shutdown probably is a sign German luxury carmakers are gaining share, Himanshu Patel, an analyst at JP Morgan Securities LLC in New York, said Monday in a new report about Johnson Controls Inc. JCI generates about half of its auto-parts revenue in Europe, where vehicle production in the fourth quarter probably will be higher than analysts estimate, Patel wrote in a report. Boosting demand for luxury vehicles, investment banks are rewarding workers with promotions as they recover from the financial crisis. Goldman Sachs Group Inc., the most profitable securities firm in Wall Street history, last week named a record number of employees managing director, boosting their pay and status. The United States is the world's largest luxury-car market. BMW, which makes the Mini and Rolls-Royce models in addition to its own brand, increased sales worldwide by 13 percent to 1.19 million vehicles through October, while deliveries of Mercedes and the Smart city car rose 12 percent to 1.04 million. BMW produces the recently overhauled 5 series, and the 6- and 7-series models in Dingolfing, the carmaker's largest plant. The X1, introduced late last year, and 1-series compact are assembled in Leipzig. Some BMW factories will still stop production around the Christmas and New Year's holidays to carry out necessary maintenance and to restock supplies, Rebstock said. “This year we're keeping the breaks as short as possible, while last year we had them as long as possible,” he said. Daimler's Hamburg plant, which makes exhaust systems, axles and steering columns, will remain in operation through the holidays, said Nicole Kicherer, a spokeswoman for Daimler in Stuttgart. Most auto factories will halt production between Christmas Eve and New Year's Day, which would be about one to two weeks shorter than last year, she said. VW's Audi and sports-car maker Porsche AG have no plans to shorten the Christmas shutdown. Audi will shutter its German factories in Ingolstadt and Neckarsulm as planned between Dec. 23 and Jan. 7, also to carry out end-of-year maintenance on production lines, said Ralf Mattes, spokesman for Audi's works council. Still, Audi will add shifts in December on Saturdays and overnight from Sundays to Mondays “to cope with record orders,” Mattes said. Audi's plant in Brussels, where the new A1 compact is made, will resume production already on Jan. 3, he said, noting the carmaker's five factories decide on winter breaks individually. Porsche will shut its main plant in Zuffenhausen from Dec. 24 to 31, while a factory in Leipzig, where the Cayenne SUV and Panamera sedan are assembled, will be closed from Dec. 24 to Jan. 9, spokesman Heiner von der Laden said. The sports-car maker has no plans to add shifts.